SALOME platform is recently updated to version 5.1.1. This latest version ported the GUI onto the QT 4. For the old version 4. *, in which QT 3 is used, I suggest reading "Polishing GUI of older SALOME versions". This poster introduces the installation procedure of SALOME 5.1.1. It is not difficult since the whole process is performed with help of a graphical interface and I already extracted the potential problems you might encounter in this article. All of the following instructions are tested on Ubuntu 9.04, and they are also compatible with the latest SALOME 5.1.3. For Ubuntu 9.10, you have to read "Installation of SALOME 5.1.2 on (K)Ubuntu 9.10 64 bit" for additional issues. Okay, before start installing, we'd better fix two problems in advance. They replace "sh" with "bash", otherwise, there will be errors during the installation of SALOME, as shown in the following pictures. 2. An old version of the gfortran library libgfortran is necessary to enable the mesh module in SALOME. Execute the following commands to create a symbolic link so as to let a libgfortran.so.1 present. After the link is created, update the search path index. An error like this will be encountered after the installation if there is no libgfortran existing. Matter of fact, it is also feasible to execute the above commands after the installation of SALOME. Now you can launch the install script "runInstall" inside the directory InstallWizard_5.1.1_Debian_4.0/, which is obtained by extracting the suitable tar.gz package downloaded from the SALOME website. For Ubuntu 9.04, you can use Debian Etch version. Following the wizard it is easy to install SALOME. It will take a while to finish the installation. You may see an warning like this after the finished installation. You just leave it. It doesn't matter. Now you will have two directories "salome_5.1.1" and "salome_appli_5.1.1" at the installation location. Ship into salome_appli_5.1.1 and by running the script "runAppli" you could launch the SALOME software. If encounter an error probably saying that the file .omniORB_%your username%_%your host name%_2810.cfg couldn't be found, you can manually create a sub-directory "USERS" under salome_appli_5.1.1 and try again. So far the SALOME should be ready to use. Thank you for this installation manual. I used it succesfull on an Ubuntu 32 bit installation. Now I am trying the same on a 64 bit installation and I get nowhere. ./runInstall: line 24: syntax error near .. Please check the installed Python package. Salome needs 2.4.4 but it is included in the installation. Currently the latest version is 5.1.2. I did try 64 bit and didn't encounter any problems. 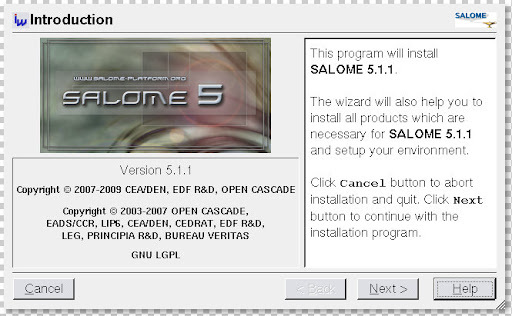 Did you download the 64 bit version, or still tried to install & run a 32 bit version SALOME onto the 64 bit Ubuntu? SALOME uses an old version Python internally. I don't think your python 2.6.2 will make troubles. Could you show more details about the error? Thanks for your work on getting this to run. It helped me get to the point where things seem to be running. 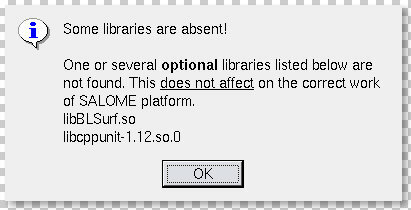 I did get another error at the end though in the same message that you have about optional libraries. This one said that a libg2c library was missing and was required. In running SALOME I find that the mirror transformation doesn't launch an input box so I'm not sure if these issues are related. Any thoughts? Good, I am happy to see it is helpful. It seems that the install wizard was compiled for 32 bit, and you therefore need this to support running 32 bit programs on 64 bit platforms. Could somebody help me out there : I got a little problem during Salomé 5.1.3 installation on the last Ubuntu distribution (10.04). "There is no available disk space for installing of selected products"
On my Xterm window, it is mentionned that there is no file or directory named checkSize.sh . If somebody could help me from this, it would be very nice. Best regards to all Salomé users ! It should be located under the sub-directory 'config_files'. If the file does exist there, it is then about the permission to execute it. When using 'ls' in Xterm, files with green names are executable. If checkSize.sh is not green, it is not executable. Hope it helps and good luck to you. I installed SALOME_5.1.3 from your procedure. Can not load library libSMESH.so. libgfortran.so.1: ne peut ouvrir le fichier d'objet partagÂ@: Aucun dossier de ce type. What can be reason for that ? Can you check whether gfortran is present and did you execute the following commands as instructed in the post? At least I think the absence of libgfortran.so.1 is related to this. Can you try and good luck to you! I hope that this solution doesn't disturb the good performance of code Saturne which I use (2.0-rc1)!!! Please, which is the function of ln -s command ? and updateddb command ? Also you can Google the commands to find much more accurate explanations. You are welcome. :) Happy to communicate and exchange ideas! I created my geometry in SALOME and I exported my Mesh as med file, but Saturne code can't read this Mesh and I had this error. Le format de fichier "MED" n'est pas disponible dans cette installation (fichier "/home/rezki/Hydrofoil/1_study/rezki1/MESH/Hydrofoil.med"). I created my geometry in SALOME and I exported my Mesh as med file but Saturne code can't read this Mesh and I had this error. Knowing that I installed libmedc-dev (#$ sudo apt-get install libmedc-dev). MED lib is absent. Since you installed libmedc-dev, I assume it is not linked with Code_Saturne. You compiled Saturne manually or installed it with apt-get? I am not sure if you used apt-get, but I think MED should be usable, because libmedc1 is in the dependency list. We have to confirm. If you compiled Saturne, Saturne would find MED as long as libmedc-dev was installed in advance. Thank you, it works with UNV. I don't know which is the reason for that. I will send listpre file to Saturne forum. You are always the Best :). You can also send the listpre file to me. My gmail account name is salad00. I sent to you listpre and my géometry. Thank you very much for your halp. After creating a complex 2D geometry, I want now to pass to 3D geometry without redoing all work. For that, I tried to create a vector (perpendicular to the geometry) and I prolonged my geometry (Operations > Transformations > Translations), but I doesn't succeed. Please, you know what should to make to resolve that ? I assume you have already known that 2D mesh cannot be handled by Code_Saturne, because of its FVM algorithm. Unfortunately I don't understand French much :( but I guess this is the reason due to your second question. If you want to extrude the 2D model to a 3D model, what you need is actually "New Entity > Generation > Extrusion" rather than "Operations > Transformations > Translations". Then use the 2D geometry as the base, and the vector created as the vector. You can try and see. I assume you have seen my new conversation on saturne forum (https://code-saturne.info/products/code-saturne/forums/general-usage/335742404) :). I extruded 2D model to 3D and it works, but I have an other problem which I posed in the mentioned conversation :(. Good. I am sorry I didn't notice your posts in "General usage". I suggest setup groups on the mesh and assign meaningful names to these groups in SALOME before exporting the model to Code_Saturne. The groups can be inlet, outlet and wall etc. Then it is easier to use them to define boundary conditions in Code_Saturne. for example of defining groups. In the simple rectangular geometry, 4 face groups are defined to correspond to the boundary conditions. Thank you, your post is very interesting. I have already created groups and named it in SALOME but when I exported the mesh I have an error with boundary conditions in Saturne. Please, if you have time, I send to you my meshed geometry (SALOME) and XML file (Saturne). The problem is resolved by using groups which I named (inlet_3D,....) and introduced them in "selection criteria". I received your mesh and xml file but unfortunately I had one day's meeting yesterday and thus didn't find a time to see it. Sorry about that. Fortunately you solved the problem by yourself. It is pretty good. You are welcome. Don't hesitate to communicate. Sorry if I exaggerate, but I have just a question about SALOME use : Please, How realized the structured mesh for boundary layer ?